At last, the Top Hill Footpath is completed today. The photos were taken late in the afternoon, i.e. about 4 pm and therefore there is a strong evening sun overcast on the footpath. Two species of the heliconias that I planted here are the psittacorum and the latispatha varieties. 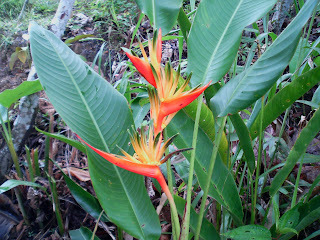 In the picture below, towards the foreground on the right is the inflorescence of the Heliconia psittacorum which is commonly referred to as the parrot flower.This variety has yellow and pink bracts. The stock for the parrot flowers above were taken from the valley section of the hill as shown clearly in the picture below. 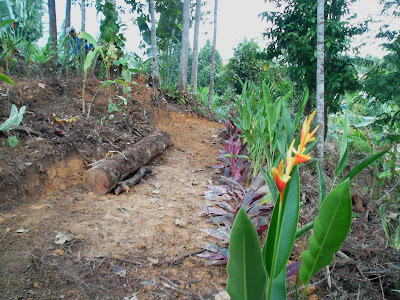 On the left side of the footpath in the picture below are planted the Heliconia latispatha. This variety is indeed a pleasure to see and for that reason I have taken a close up view of the inflorescence. 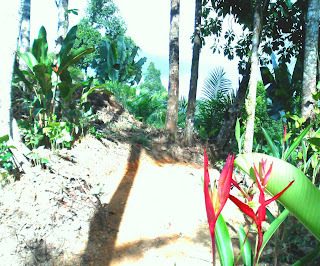 Below is the CU view of Heliconia latispatha. This variety has green colour at the tips of its bracts. Total manhours for the Top Hill Footpath is 9 man hours. 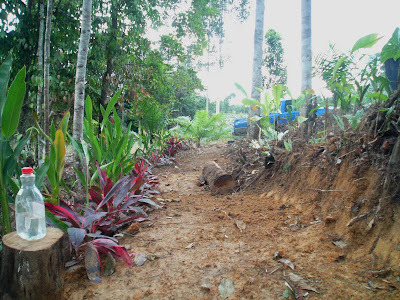 On Friday and Saturday last week, the lipstick red footpath was planted with heliconias and ground cover plants. 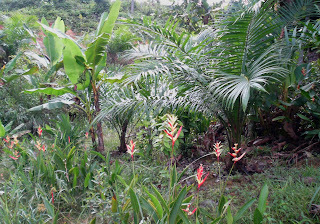 On the left of the picture is planted the 'parrot flower' heliconia ( Heliconia psittacorum) . The reddish ground cover plants are the 'red ti' or 'fire brand' ( Cordyline terminalis). In the miidle of the footpath is the belian log that has been cut and to be used for benches, stools etc.later. 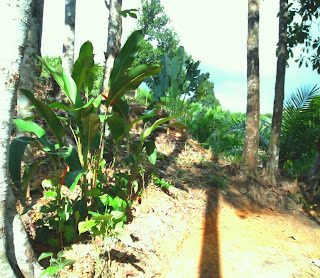 On the left of the picture can be seen white caladium ( Caladium x candidum) planted as ground cover for the heliconia stratas above.